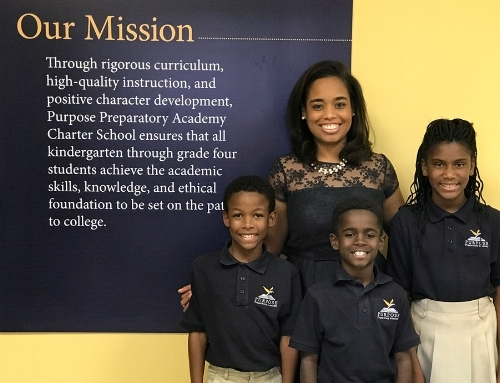 Purpose Preparatory Academy Founder Lagra Newman with some of her students. One of the things that sets public charter schools apart from traditional public schools is our autonomy. Because we independently operate our schools as nonprofit organizations, we have the flexibility to innovate and design school environments that best meet the needs of our students. On the flip side, autonomy can also mean isolation. Many public charter operators in Nashville and around the country start their journey with a single school, leaving teachers and leaders with little opportunity for collaboration. But for successful charter organizations in Nashville, that’s beginning to change. Today, we are excited to announce the formation of the Nashville Charter Collaborative. In essence, we have formed our own professional learning community where our ideas and experiences can be shared for the benefit of each others’ schools. We have been meeting informally as a group for many months now to talk about issues all public schools face as well as issues unique to public charter schools. Through these discussions and the efforts they have spurred outside of our meetings, we are able to offer each other professional support and partnership. We lean on each other as thought partners. We elevate and learn from one another’s good work, and we collaborate to address common challenges. How we keep this good thing going and growing has been one of our discussion points. And we finally landed on a solution. The Nashville Charter Collaborative is now formalized as a program of the Tennessee Charter School Center. Giving our group an official structure under TCSC will allow us to further strengthen and grow the shared supports that we have come to find so beneficial. And we look forward to using this structure to help our schools continue to thrive both individually and collectively. Our group also strongly believes in the importance of collaboration between public charter schools and traditional public schools within our school district. One of the reasons public charters schools were created in the first place was to incubate innovative practices that could eventually serve more students in all school settings. And we want to learn from ideas being developed in traditional schools as well. We have already started this collaborative work by strengthening our relationships within the district and our new structure will only allow those connections to grow stronger. So who is in the Collaborative? Our group is comprised of 12 charter organizations. Together we represent 32 public schools and more than 12,800 students across Davidson County. In addition to sharing a track record of high achievement and high growth, we also share the core belief that education transforms lives and that every child in Nashville has the right to a high-quality public education. You can see a complete list of our member schools at this link. One way we will be collaborating with each other and the public is by sharing our stories. In the coming weeks and months you’ll be able to read these stories here on this blog. They’ll be stories that will broaden the insight and perspective of educators, parents and engaged community members alike, regardless of school type or preference. Nashville is a thriving city. Our students—every single one of them—should be provided the opportunity and education to be a part our city’s success. No one person or organization has all the answers to get us there. But together, we absolutely can.